Offer your friends and relatives a boating holiday gift voucher so they can discover France’s most beautiful waterways. If you’re looking for that ideal present, stop looking now: offer a boating holiday gift voucher. What could be more original than getting away from it all on a river cruise on a self-drive boat with no license or experience required. You decide how much you want to spend and pay by either cheque, card or bank transfer. 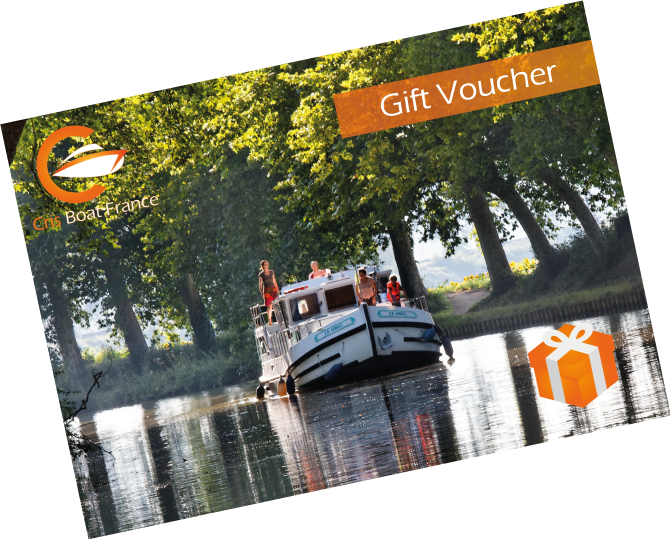 In return, you will receive a gift voucher that is valid for use when reserving a boating holiday from any of our starting destinations (Canal du Midi, Brittany, Burgundy, Lot, Charente, Mayenne, Alsace, Ardennes and Eeklo in Belgium). The beneficiary contacts us to fix the date and duration of their holiday as well as the type of boat. If the amount payable exceeds the value of the gift voucher, the beneficiary must pay the difference.